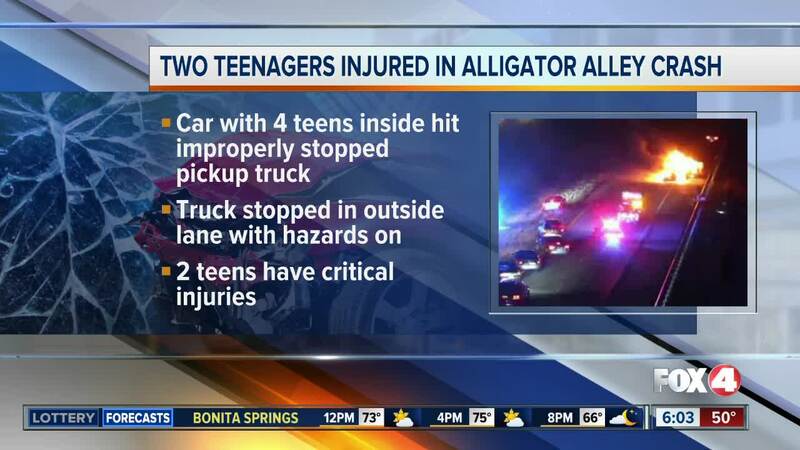 COLLIER COUNTY, Fla. -- Two Marco Island teenagers were critically injured and two others had minor injuries after a severe crash on Alligator Alley. It happened just before 7 p.m. in the northbound lanes of Interstate 75 near the Collier-Broward county line. Florida Highway Patrol says a pickup truck was improperly stopped in the outside lane with its hazard lights flashing when a vehicle slammed into it. The two vehicles then caught fire, shutting down the northbound lanes for hours. 4 people were in the vehicle that crashed into the truck, all of them teenagers. The driver, 17-year-old Jonathan Hurtley of Marco Island, and 18-year-old passenger Anthony Blanco from Naples sustained minor injuries and were treated at NCH North. Two other passengers from Marco Island, 19-year-old Sarah Lintz and 16-year-old Joshua Jordan, were taken to Broward General Hospital with critical injuries. Troopers say the left northbound lane reopened around 9:20 p.m., but the right lane remained closed overnight until emergency road repairs can be made on Tuesday.